The photo booth mode in DSLR Remote Pro for Windows, NKRemote, PSRemote, Webcam Photobooth includes the ability to shoot green screen photos and automatically replace the background with the scene of your choice. Green screen photography works by taking photos of the subject in front of a green background and then automatically replacing the green background with a new background image. The background image can be anything you like such as an exotic location, a cityscape or photos of well knnown celbrities. Green screen shooting is available with Canon DSLRs and Nikon DSLRs that have live view, Canon PowerShot cameras and webcams. 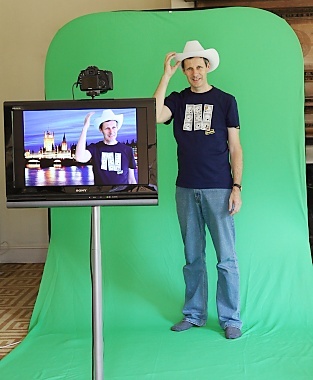 Green screen shooting is also available with our flip book software, Flip Book Photobooth. 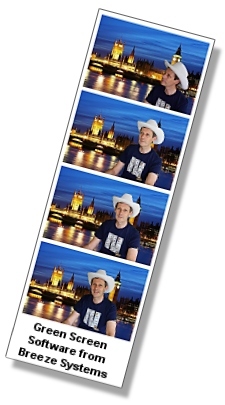 Please see the section on green screen shooting from this series of articles on photo booth shooting to help get the most from our photobooth software. The live view display automatically replaces the green backgound with the background image in real time. This means that users see live view images of themselves in front of the final background and not the green background that the camera sees. An optional overlay image can be placed over the live view images to provide a foreground layer. By combining live view with green screen and an overlay image users are able to interact with a virtual scene containing both foreground and background elements. This could be jungle scene with foreground bushes to hide behind, a mock up for a magazine cover or anything that has a background and a foreground. 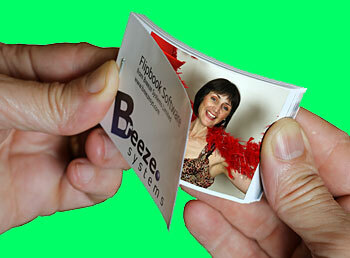 (Please note: green shooting using Flip Book Photobooth doesn't include the use of overlays). Our photo booth and flip book software will take the photos, perform the green screen removal and print the images without the need for any other software. Please see the DSLR Remote Pro for Windows, NKRemote, PSRemote or Webcam Photobooth help files for information on how to setup green screen shooting. Please note: The green screening is optimized for speed not quality in order to be able to display the greenscreened images in the live view window in realtime. The quality should be good enough for small photos and prints, but if you want large high quality results you may need to use specialist green screen software such as FxHome PhotoKey.